Exploring the backlot of Leavesden Studios can be frighteningly surreal for a Harry Potter fan. Look one way across the site's eight acres and there's Privet Drive, complete with paved roads, lightposts and mowed lawns ("gardens" in the UK). With a turn of the head, your eyes come to rest on the Hogwarts Quidditch pitch, Hagrid's Hut or one of several new exteriors for Harry Potter and the Half-Blood Prince, which boasts the most backlot construction of any film in the series to date. 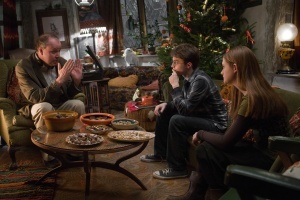 In HPANA's upcoming behind-the-scenes look at the sixth Potter installment, the aforementioned trio plus Bonnie Wright, Tom Felton, Matthew Lewis, Jessie Cave (Lavender Brown), director David Yates and producer David Barron provide an inside look at the newest film. Some highlights: visiting young Tom Riddle's orphanage, the mammoth cave set and the Weasley's Burrow (complete with the family clock -- all hands pointing to "Mortal Peril"). As always, stay with HPANA through November for all your Harry Potter news needs, including our full behind-the-scenes report. One final word until then: It's apparent to this editor that the Potter franchise is a well-oiled machine and in capable hands with Yates at the helm (just look at the teaser trailer for early proof). Yes, some dramatic changes have been made throughout the series (with even more in Prince), and the purists can scream bloody murder all night long, but these films are representative of JK Rowling's universe, and as producer David Heyman likes to say, "keeping in spirit" with the books.